OH LOOK… A TIME MACHINE! | The Weirdo. HomeOH LOOK… A TIME MACHINE! OH LOOK… A TIME MACHINE! Located in London’s Borough of Kensington and Chelsea, Brompton Cemetery is arguably one of the most stunning Victorian cemeteries in the world. It opened in 1840 and was originally known as the West of London and Westminster Cemetery. Consecrated by the Bishop of London in June 1840, it is one of Britain’s oldest and most distinguished garden cemeteries and houses 35,000 monuments, from simple headstones to substantial mausolea, mark the resting place of more than 205,000 burials. Half-hidden amongst the shrubbery, one very mysterious mausoleum, which is believed to be a Time Machine. An imposing construction, decorated with elaborate Egyptian-like figures, houses a mysterious trio of spinsters about whom almost nothing is known. 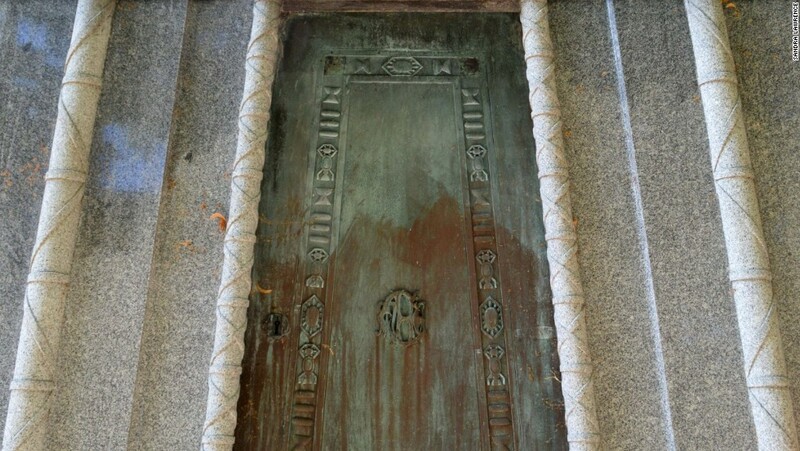 The wealthy Courtoy spinsters, an unmarried mother and her two daughters are reputed to be buried inside, but the key is missing and the huge bronze door has not been opened in more than 120 years. Nor can any plans can be found for the mausoleum, setting it apart from other structures in Brompton cemetery, which required careful planning and schematics to be approved. The imposing trapezoid of dark polished granite is twenty feet tall and decorated with narrow bands of carved hieroglyphics – not surprising, when one discovers that the builders of the mausoleum were Samuel Warner, an english inventor, and Joseph Bonomi, an architect and Egyptologist. Bonomi was part of the team that first deciphered the hieroglyphic texts found on papyri in Egypt’s Valley of the Kings. Some speculate that the text he studied discussed the possibility of time travel, a topic which fascinated the Victorians. At the time of his death, Samuel Warner was in negotiations over his plans for aerial bombs and sea mines with Duke of Wellington, and his unmarked grave lies nearby. Sixty feet away, Bonomi’s gravestone bears similar hieroglyphic carvings to those found on the mausoleum, including a portrait of the Egyprian God Anubis, Protector of the Dead. Anubis appears to be sitting on a depiction of the mausoleum and staring in its direction. To add to the mystery of the site, some people believe that Samuel Warner was either murdered to prevent his designs for weapons falling into the wrong hands, or by someone who stole them from his dead body. Others believe that Warner was a fraud and a charlatan whose inventions never worked. Together, Bonomi and Warner may have developed plans to build a time machine, and gathered financial support for their venture from the wealthy, eccentric Courtoy ladies. Maybe the women wanted to cheat death and travel into the future. Perhaps they felt no one would suspect that a building in an isolated corner of a graveyard could be an experimental doorway through time. After death, they vanished as surely from the face of the world as if they had stepped out of this era and into another, for there is also almost no trace of the Courtoy spinsters; they left no records of their existence, even though the opulence of their tomb suggests they were immensely wealthy. In 1853 as the Courtoy mausoleum was completed, the Irish Peer Francis Jack Needham, the 2nd Earl Kilmorey, sought permission to build an Egyptian-style mausoleum in Brompton Cemetery for his mistress, Priscilla Hoste. After much quibbling and at great expense, the Kilmorey mausoleum was built, but frustrated by persistent bureaucratic red tape, Needham moved it to the grounds of his house at Chertsey Park in Weybridge in 1863. Why did the cemetery officials give Needham such a difficult time? Perhaps they felt that one mysterious, eccentric Egyptian-style time machine on their grounds was quite enough?! Oh Damn this is fantastic!! I just wanted to keep reading as I love all thing’s ancient Egyptian, Victorian, intrigue, history, grave’s…..